Christmas is the time of year that everyone loves. From the smell of freshly baked cookies hanging in the air to the lights strung on houses and trees; Christmas is definitely in a class by itself. 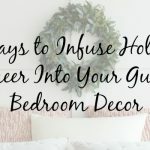 We’ve found some incredibly creative ways to bring that Christmas feeling to your beach house. 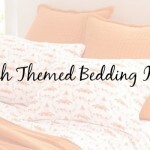 Whether your decorating style is classically traditional or a little bit quirky, we’ve got something you’re sure to love. Our first item comes from our Cottage & Bungalow collection. 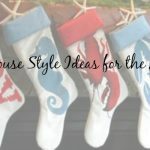 You can’t have a Christmas celebration without hanging your stockings by the chimney with care, right? 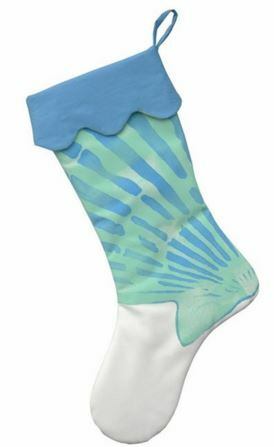 We have a fun beach-themed stocking that will be the talk of your holiday get-together. Our blue scallop stocking is sure to spruce up your beach house in style. You have to admit, it’s not every day you see a beach-themed stocking. 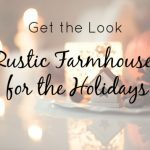 We love bringing these quality-made, unique items to you and your family. I have a friend who collects Santa themed items. Her house is filled with everything Santa from salt and pepper shakers to dish towels. It’s incredible what she has collected over the years. 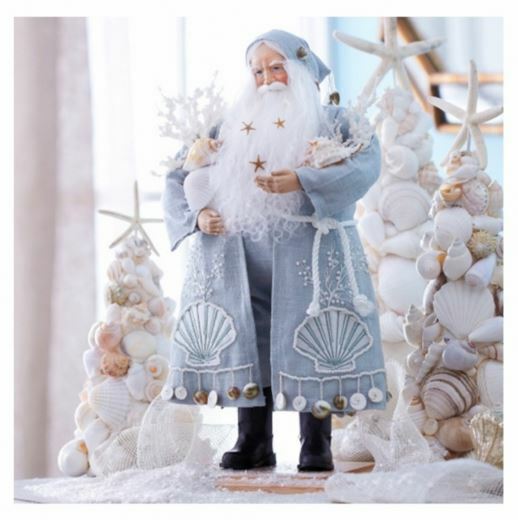 This Joy of the Seas Santa statue would be the perfect addition to your holiday décor. We found this treasure on beachcoaststyle.com and love how it incorporates the icy North Pole with the warm, relaxing beach. 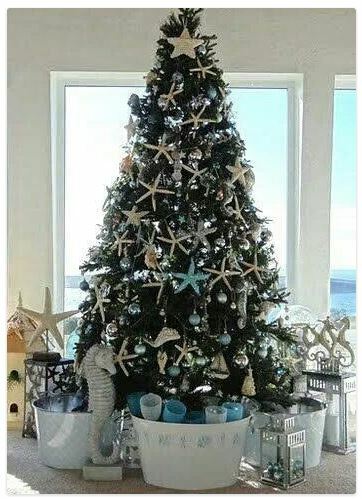 Our favorite part is topping the Christmas trees with starfish; simply genius! What is Christmas without a tree? This creation brought to you by nauticalcottageblog.com brings the magic of starfish to your Christmas celebration. Add a few of your family-favorite ornaments to personalize your tree or keep it beachy with a few seahorses and sail boats. Whatever you choose, this tree is sure to be a hit. This next find is super cute and crabby. 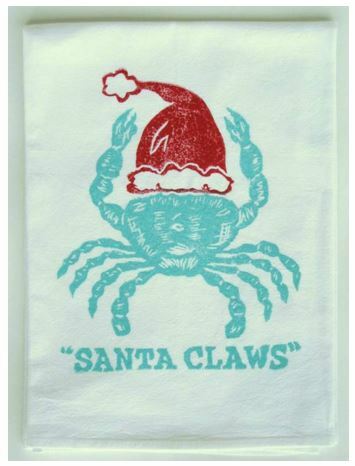 This “Santa Claws” dish towel is one of the many incredible beach décor items we found at swimspot.com. You could use this dishtowel as you prepare your Christmas dinner or hang it on the wall in your kitchen as a conversation piece. No beachy Christmas celebration would be complete without sand. 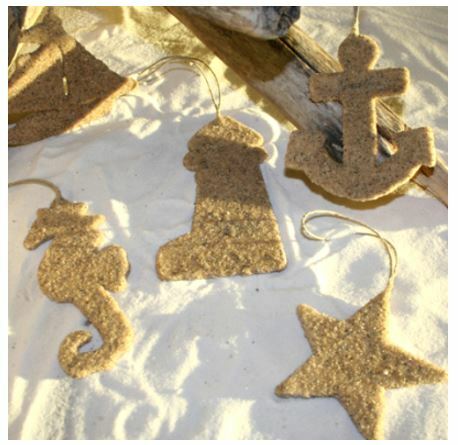 These charming nautical sand ornaments from completely-coastal.com are the perfect addition to your collection. Use them on your tree or tie them to gifts to add that special touch that can only come from the beach. You can even make your own sand ornaments by cutting shapes out of cardboard, punching a hole in the top for a twine hanger, brushing the shape with Mod Podge, and covering with sand. Voila, you have your very own personalized sand ornaments. 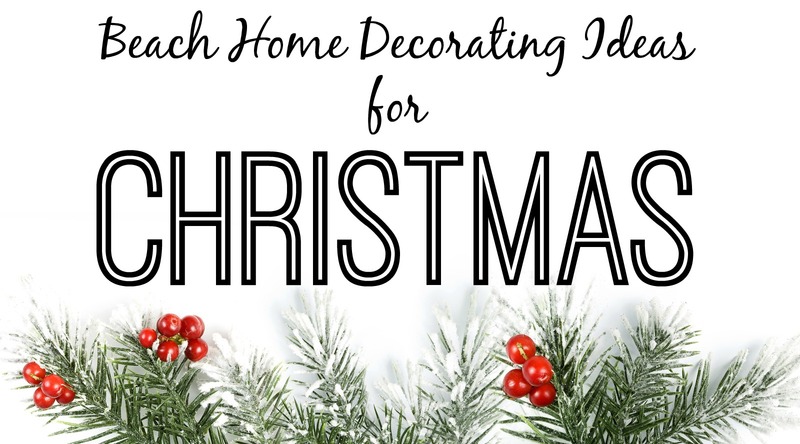 We would love to know what your beach house Christmas decorating traditions are in your family. Leave us a message in the comments below and share your thoughts.